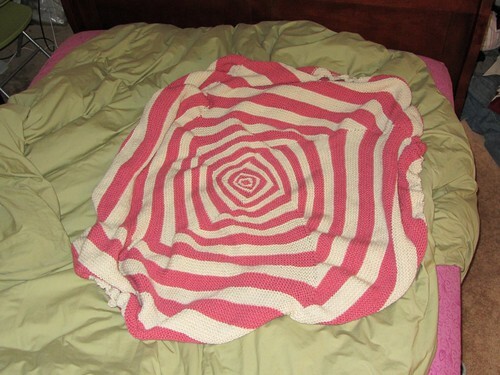 Several years ago, I made myself an Op Art blanket from Melissa Dominguez’s pattern in the Fall 2008 Knitty. You may remember I blogged about it here. At the time, I thought that I probably would never make another one, since it’s really A LOT of garter stitch, and gets pretty unwieldy at the outer edge. Back in December, I was showing off my Ravelry catalog of finished projects to Bob (I know, I know, I am super cool) and he LOVED my OpArt. He asked if it would be hard to make a second one. Gotta love non-knitters–even garter stitch impresses them! Of course I knit a second one. We went to the yarn store to pick colors, and I was a bit surprised when Bob picked the exact same pink and cream color combination I had used originally. I mean, it’s an awesome combination, but a bit unexpected for Bob. On my original blanket I used cheap One Pound yarn by Caron. For Bob’s blanket he sprung for something a little nicer to work with–Berroco Vintage in colorways Watermelon and Buttercream. 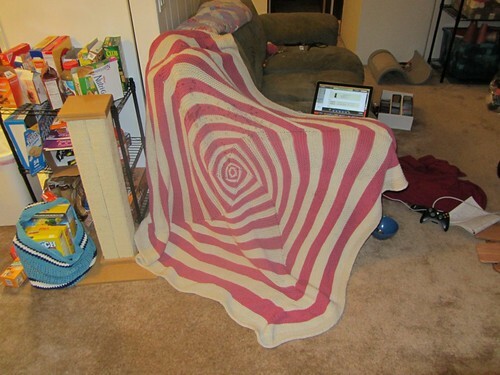 That’s the blanket in action (and in really poor lighting.) I followed the pattern as written and knit through the stripe that is 10 garter ridges wide (half-way between the small and large sizes.) Because the pattern calls for DK weight and I was using worsted, I upped my needle size to a US 9. I also used a I-cord bind off rather than a normal bind off to give more stretch and a more polished edge. I knit on this a lot while I was studying for the Washington bar exam so the garter stitch wasn’t as painful as the first time around (or maybe the pain was just so far outweighed by bar exam pain that it seemed small in comparison.) Still, the last few stripes were a real slog. I may be jinxing myself, but I really hope this is my last OpArt. Great finished product, but not very exciting on the needles. I’ve mentioned in my last few posts (spread over 6 or so months… I know… I know…) that from about May of last year until two-ish months ago I really lost my knitting mojo. Lots of changes in my life certainly contributed–end of a big relationship, a move across town, old job that I hated to wake up to, new job that I do not hate but that is super challenging in other ways, another bar exam… by the time I got any alone time I would end up just holding my knitting but not actually creating any stitches. I did not like that knitting had taken a major back seat in my life so I decided to try and change that. I decided that what I needed was something simple. Something so simple that I would normally never consider it. So simple that I could do it blindfolded, in the dark, with one needle tied behind my back. In short, I needed lots and lots of garter stitch with no shaping. Hello Garter Squish by Stephen West. 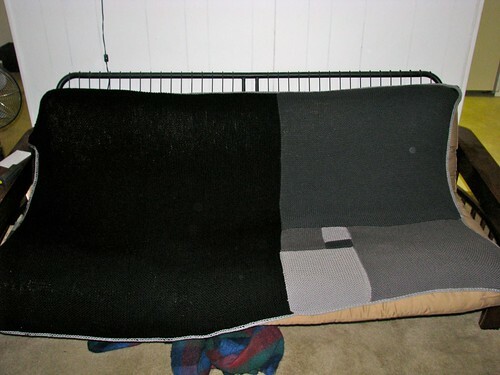 It’s a blanket made with two strands of yarn held together, done on size 15 needles, entirely in garter stitch. Not to toot my own horn, but I could knit this dead. Which was exactly what I needed since that is exactly how I felt at the end of the day some times. I couldn’t handle decreases. I couldn’t handle increases. Or short rows. Or charts. But I could do the knit stitch, over and over, endlessly. The pattern (yes there is actually a pattern) calls for two strands of worsted weight yarn to be held together to make a super bulky yarn. I held one strand of worsted and one strand of DK together because I am a rebel. The DK was Berocco Vintage DK all in the color Cracked Pepper. The blues are Berocco Vintage Worsted in Neptune, Tidepool, Emerald, and Breezeway. I used the highly sophisticated stripe technique of knit with one color until the ball is completely gone, begin using next color. I had two balls of each blue color, so once I went through the color repeat once, I just started over and did it again. Tres Modern. If it looks like some stripes are 19 garter ridges and others are 22, they are. I can deal. The double yarn combined with the garter stitch make this a super squishy blanket. It’s also really really stretchy. Unstreched its about as wide as twin bed and maybe 2 feet longer, but it can stretch to gigantic proportions. I started in October of last year and finished just before Christmas. I gave it to Bob for Christmas 1) because he is my best friend and 2) because he only had one smallish blanket and if you are friends with me you need lots since I am perpetually cold. It gets used near daily and some of the end have worked their way out, so I need to give it a little TLC and weave them back in. Overall, I’ve been super pleased with the finished object and with the care and use I’ve seen it receive. 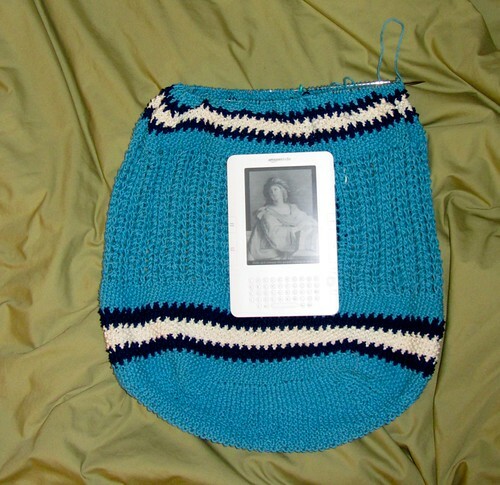 This project really helped get me knitting again when I had stopped almost completely. My productivity has been agonizingly slow compared to my usual, but I do find a little time most days to squeeze in a stitch or two. I finished my Op Art. Truth. I know it’s been on the needles since forever (June 30, 2009 cast on according to Ravelry.) Don’t you hate how Ravelry can remind you that you’ve been a complete and utter slacker when it comes to those lingering projects that just won’t finish themselves? LOOK! It’s true what everyone says about blocking this, you have to be highly aggressive with it. It comes off the needles totally wobbly and not at all square. 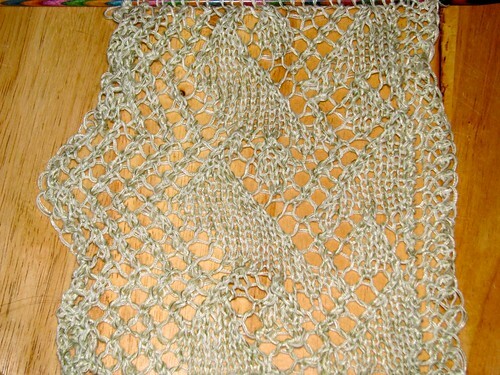 Here it is laid out pre-blocking. See how it’s all dimple-y and swirly at the corners? No good. Time for pins and a yardstick. 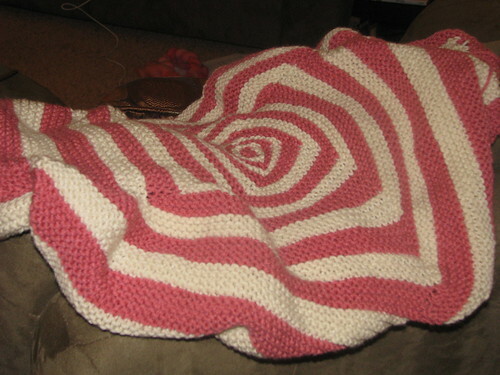 I started from the center and pulled out one row of corners along the spiral and pinned them out. Then I pulled out all the corners on the opposite side and pinned them too. Here it is half pinned. Then I did the same thing with the other two sides. As you can see from the finished pictures, at some point, I had to take a “good enough” attitude toward the whole thing or drive myself crazy trying to make it perfectly square. I used acrylic yarn (Carron One Pound in colors “off white” and “rose”) so I had to kill rather than block. After it was all pinned out I grabbed the steam iron and held it about 2 inches over the blanket and gave the thing a good steam. 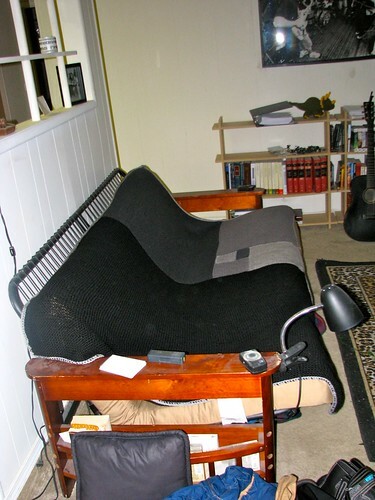 I could see the yarn physically relax and settle into the pinned position. It was pretty cool. It also made the yarn way drapier and much softer. Warning: if you make this blanket using this yarn, there is not enough to make the larger size. 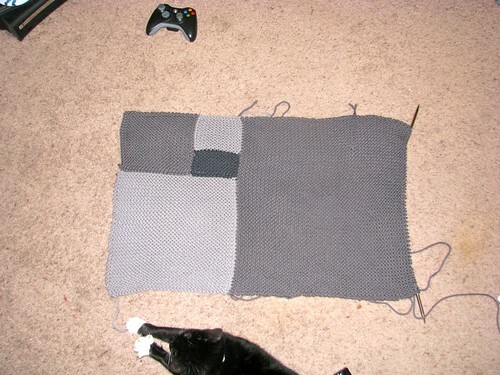 I ran out halfway between the small and large size–with 9 rows left to go in the stripe I was working on. Luckily a kind raveler sent me her leftovers and I was able to finish without having to buy a whole new pound of yarn. Now to snuggle on the couch with some hot tea, my new blanket, and an episode of Star Trek. I hate being cold, but I love being cozy… winter is a weird season for me. Recently, I’ve been cruising right along on several projects. I’ve got… eleven… current projects and over the past weekend I think I managed to work on 7 of them. Part of the reason I was able to work on so many was that I kept running out of ^*$# yarn. First, I decided to work on the market bag I’m making for my mom. That’s BYOB by Moria Ravenscroft from the Summer 2008 Knitty. I’m making it with Knit Picks new cotton yarn Dishie. It feels like a great yarn for market bags, dish towels, scrubbies, etc. but I would never make something like a garment with it–too stiff, it would never drape. Soft, but stiff. The pattern calls for two balls of a yarn that is 207 yards per ball for the main color. Dishie comes in balls of 190 yards. As you can see, those extra 34 yards are critical. All I have left to knit are the handles. An emergency ball is on the way and hopefully I’ll have the bag done soon. After that disappointment, I picked up a project I haven’t worked on in quite a while and got pretty close to finishing. 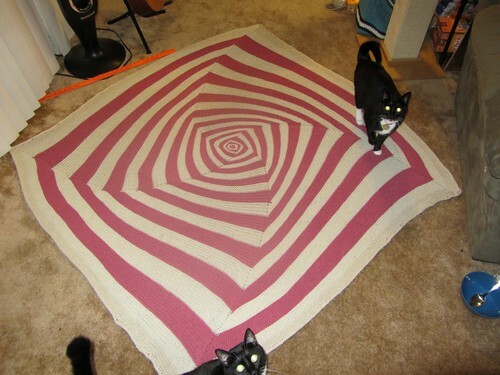 That’s the Op Art blanket by Melissa Dominguez from the fall 2008 Knitty. 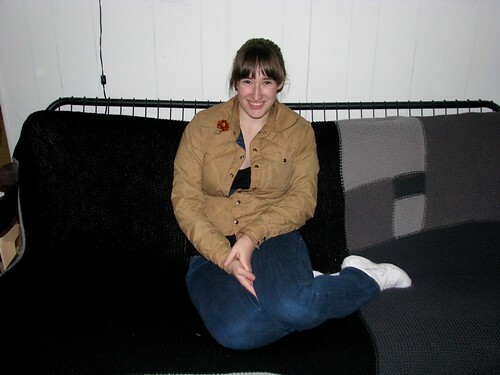 (Clearly 2008 was a good year for Knitty). I started this when I first moved to Oregon way back in July 2009. Mostly, I started it as a way to use up the two huge skeins of Carron One Pound I was given by a well meaning family friend. I figured two POUNDS of yarn would be enough to finish a moderate-sized blanket. Imagine my extreme frustration when I ran out of yarn 9 rows from the end. Since the size of the stripes matters, I can’t just stop where I am and bind off. I could go back to the last whole stripe, but I really wanted it to end on a white stripe… My own weird aesthetic. That would mean going back a whole strip and a half and would leave me with quite a lot of left over yarn, thus defeating my plan to use up all the yarn with this blanket. Ravelry to the rescue. Another kind knitter used this yarn for a project and had about 4 ounces left over. The yarn is coming to me as we speak. I love living in the digital age. I could not function in a world without “the cloud”….. mmm instant gratification, instant information, instant organization. Had I not run out of yarn on these two projects I probably would have given them each some serious dedicated work and maybe had a few FOs to show for my weekend, but as it is, it was nice to revisit so many of my current projects and get back in touch with why I love them. My second knitting pattern has been released on Ravelry this week. The Golden Ratio Blanket is available through the ravelry pattern store for $3.50. This blanket is based on the mathematical golden ratio. It comes in three sizes: Stroller (Crib, Throw) 29.6”x18.3” (48”x29.6”, 77.6”x48”). 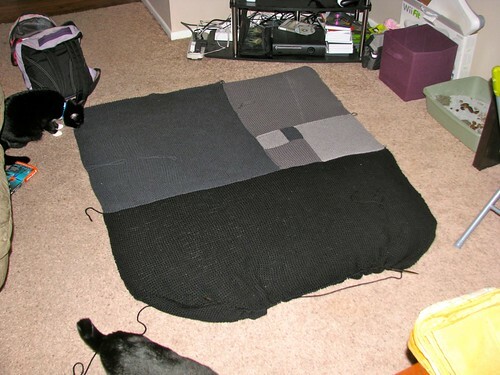 This blanket is made by starting with the smallest block and picking up stitches to add subsequent blocks. 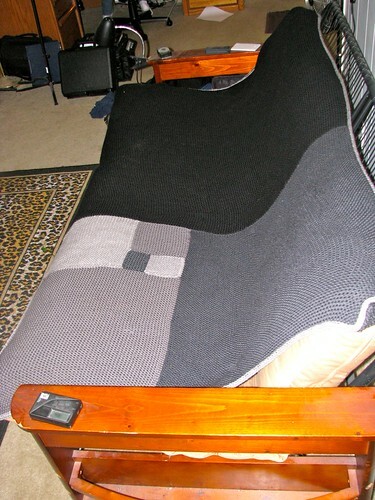 The blanket is finished with an applied I-cord edge. 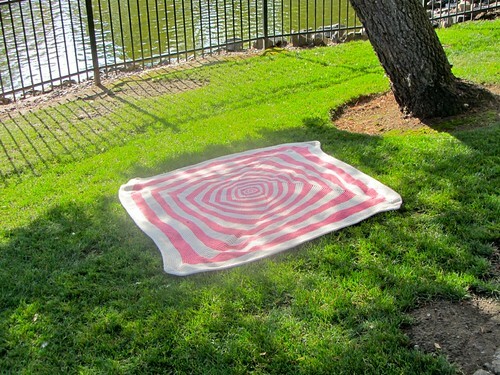 The instructions also include directions for back-stitching or surface crocheting the golden ratio spiral onto the top of the blanket if you wish. The two patterns that I’ve released can also be found on the “design” tab at the top of the posts. You can purchase them by going to Ravelry and using their checkout system, or by clicking the “buy now” button on the design tab. That blanket is 4 FEET x 6.3 FEET. As you can see, it covers Ryan’s entire futon. This monster is so big that I could barely back away from it far enough to get good pictures in Ryan’s smallish living room. (Look in the background of this picture and you can see Lucy the Triceratops who lives on Ryan’s bookshelf.) 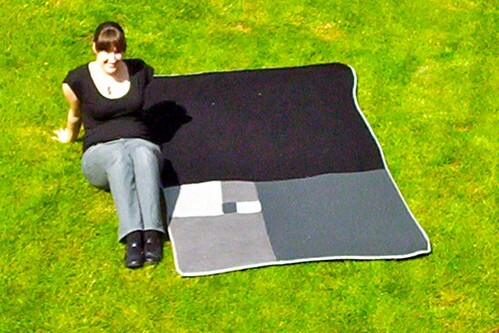 The blanket is a knitted representation of the Golden Ratio, which supposedly produces the most visually pleasing rectangle. The ratio itself appears in nature in lots of ways, tree rings, nautilus shells, even human brain waves. The rectangle is made by organizing squares next to each other in a way that keeps the ratio 1:1.61803398… (That super ugly second number is phi, one of those irrational numbers the like pi or e that basically make the whole world work.) Each square gets smaller and smaller. Mathematically, this shrinking continues infinitely. Since I haven’t yet figured out how to knit infinitely small, I had to fudge a bit at the center. 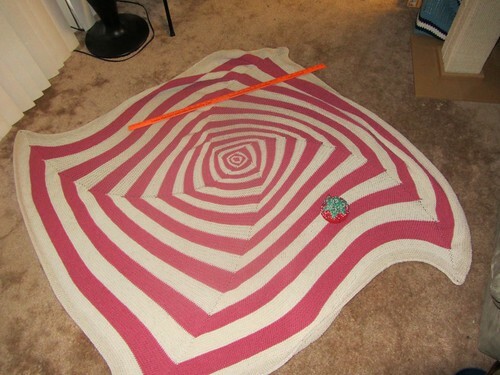 The golden ratio also creates a spiral, which I had originally intended to crochet on the top of the blanket, but Ryan decided he thought the stark geometric look was more his style. I used Swish Bulky yarn from Knit Picks (because I am no fool and knew that if this was ever going to get done I’d have to use bulky yarn.) It’s 100% superwash merino wool and it’s heavenly soft and squooshy and wonderful to handle, especially in plump garter stitch. The colors I used (from lightest to darkest) were: silver, hawk, stormy, coal. I ended up needing about 2,475 yards of yarn. That’s 1.4 MILES! It would take me like 13 minutes of running to get somewhere as far away as the length of the yarn in this blanket. I wrote up a pattern for this beast, and also for two smaller sizes: stroller and crib. They are basically created by knitting fewer of the blocks. My blanket has 7 blocks, crib has 6, and stroller 5. I also included instructions for adding the spiral in case anyone wants the complete math-nerd effect. Right now it’s being test-knit by some great Ravelers. When they get their feedback to me I’ll publish it via Ravelry and let you all know it’s there. You can also check out the Designs tab at the top. Right now the only thing there is Spring Breeze, but I hope to get a few more there shortly. That is Ryan’s blanket. Right now it’s just over 4′ x 4′ but it needs 20″ more of black before it’s finished. I try to devote one hour to it a day, but some days I just can’t bring myself to garter for that long. It’s based on the golden ratio rectangle. 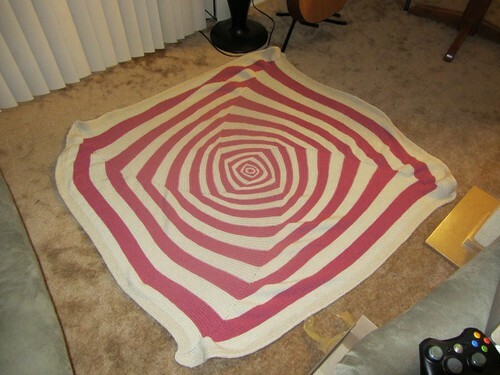 When it’s finished, it will have a big red spiral surfaced crocheted onto the top. Generally, I would say that I’m not a superstitious person. I have, on occasion, been accused of treating the scientific method as a religion in itself. However, there is one superstition that I absolutely do believe in: the sweater curse. For those of you not familiar with the sweater curse, the basic premise is that if you knit a sweater for a man (or woman) you are not currently engaged/married to the relationship will end shortly thereafter. A couple of years ago, foolish young me knit a sweater, and a couple of months after it was finished, relationship over. I’m a believer. So far, in my experience, it’s only sweaters that are cursed. I’ve had no problems with socks, mittens, hats, scarves… They don’t seem to have any relationship ending potential. So now I’m taking it to the next level. That is the beginning of a blanket for Ryan. If it looks like the Golden Ratio rectangle, that’s because it is. (Or at least it’s supposed to be… I did the math myself.) Ryan is a huge math nerd and requested this blanket. I’m hoping that means it’s safe to knit. Each new square is picked up from the squares before log-cabin style. I will surface crochet the spiral on at the end when I have finished. The yarn is Swish Bulky from Knit Picks. It is 100% superwash wool. It was the only yarn line I could find with 4 shades of gray/black (Ryan’s favorite color for knits apparently… everything I have made him so far has been gray or black.) Since this is basically a 4’x6′ rectangle of garter stitch it is fantastically boring to knit, but I can work on it while I study/watch TV. Right now it’s just under a third done, we’ll see if I can finish before Christmas. OK friends I have come up with a crazy game to play with myself to hopefully help me get some of those WIPs off the needs. Here is my plan: I am going to estimate how many days of knitting it will take to finish each of my WIPs. I will try to pick something that is a bit challenging but (hopefully) reasonable. For each WIP that I finish within the allotted amount of time I can spend $15 on yarn. That is a potential of $165 I would allow myself to splurge! 1) I must knit some each day. 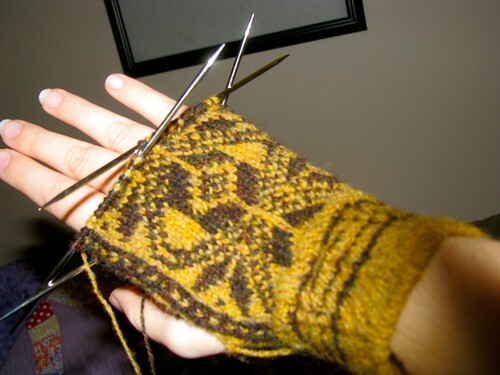 If I don’t knit one day one of my projects will still have to take a strike. 2) Each day will be allocated to one project. If I knit on more than one project I will have to choose which one takes the day. 3) Any new cast-ons (with the one exception I will explain later) will not count. If I waste days playing with new projects I may have to give up getting some new yarn. 4) Finished means completely finished. As in off the needles, blocked, seamed, buttons applied, etc. Ready to be worn/used. 5) No money can be spent on yarn, needles, notions, ect. until this challenge is over, i.e. all the days have been used up. 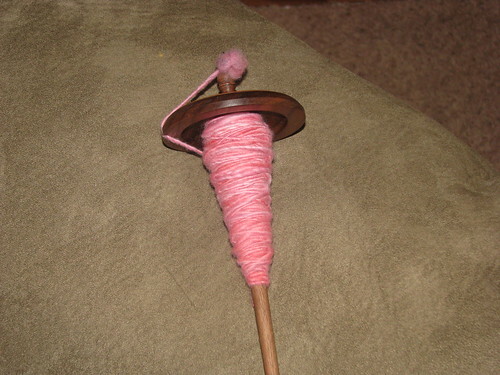 1) First spinning attempt. I bought a drop spindle and some Targhee wool at sock summit last August and started spinning away. I actually got to the point where my spinning was pretty even but then I got distracted with school and didn’t pick it up for 11 months. Now I am at it again and am getting somewhat even results… For a first attempt I’m pretty happy. Anyway, about 1 oz. of the 3.8 oz braid was used in my thrummed mittens. The rest is on it’s way to becoming yarn. According to my Knit Picks yarn scale (so wonderful to have!) I have 0.78 oz left. I’m going to be a little generous with this one and give myself 5 days to finish since I’m so new to spinning. I think two days for spinning, two days for plying, and one day for washing, drying and skeining. 2) Op Art. I have four stripes left on this blanket. That sounds pretty manageable, until I think about how each stripe contains both more rows that the stripe before and more stitches per row. I’m going to push myself and give myself 20 days here. right now it’s taking me about 35 minutes to do one row. I’m guessing I have 60 hours left on this puppy so I’m going to have to give it 3 hours each of it’s days. This is going to be my biggest challenge. 3) Hope for Change socks. My oldest WIP to date. I love the way this pattern looks, it’s just not my favorite to knit. One sock is complete the other sock is about 2/3 up my instep (knit from toe up). I’m only giving myself 3 days to finish these babies. One day to get past the heel, two days for the leg and cuff. 4) Mojo socks. These are so close to being done I can taste it. I have 45 rows left. These get one day. 5) Yeah for Fall (Green Gable sweater). This went so quickly when I was working on it. I knit the whole body in about a week. I’m going to give it one more week. 3 days to finish the sleeves, 3 days to finish the yoke and hood, and 1 day for blocking. 5) Birthday socks (Air Raid socks). The first sock is finished. 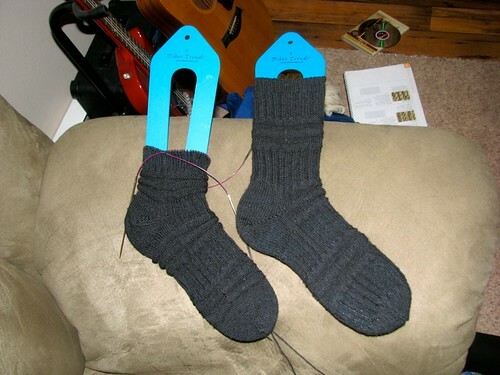 The second sock has one repeat of 6 done on the leg (knit from the top down). The first sock went very fast. There is no real reason these have taken so long other than they are my “purse” project and I haven’t had to wait very often (knock on wood). I will give these 5 days. 6) Selbu Mittens. One mitten is half done. 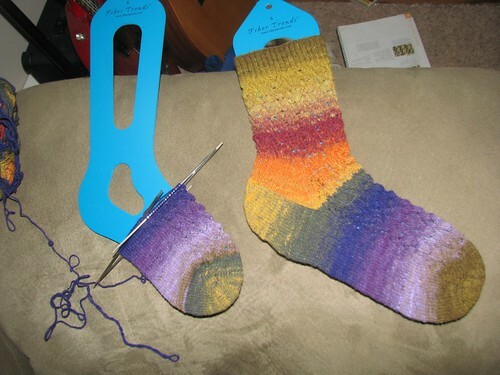 These take complete attention because I have to follow the colorwork chart carefully. With school starting on the 30th complete attention is going to be hard to give. I’m going to be a bit lax with these and give them 14 days since full devotion will be hard to muster. 7) Baby Surprise Jacket. This will go quickly once I turn my attention to it, I have just been focusing on other things recently. I am giving this 3 days. 8) Victorian Scarf. Lace, like colorwork takes a lot of attention. Also, this project is pretty huge. I have 3 repeats of 42 done, plus the center panel, which is skinny but looooooong. I am going to give this project 18 days. That is 3 repeats a day for 14 days then 3 days for the center panel and 1 for blocking. 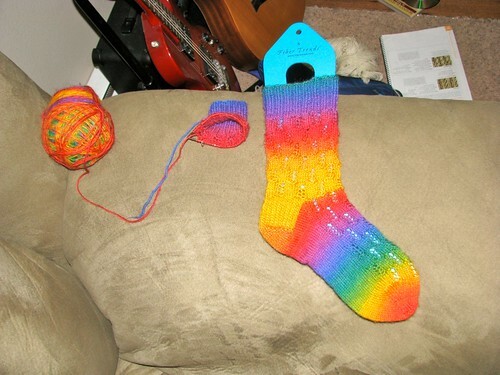 9) Pomatomous Socks. These are fun to knit but all of the twisted stitches are slow going for me. I am 1/3 through the leg (knit top down) on the first sock. I’m going to say 10 days for these socks. 10) Test Knit – Bashful. 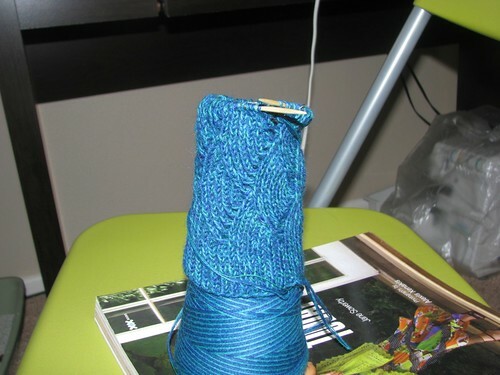 I can’t show you a picture of this one, but I’m test knitting a hat for Marly Bird aka Yarnthing on Ravelry. The hat is slouchy and DK weight but I can’t tell you anything about it until the pattern is released. So far all I have knit is the ribbing. I’m giving it 2 days since it’s a hat and hats are smallish quickish projects. 11) Test Knit – Whirligig bolero. 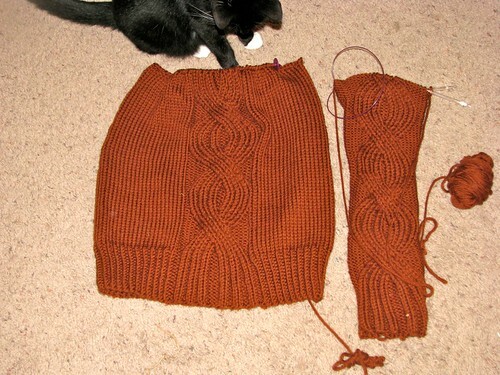 This is a test knit for Stephanie Japel to help her up-size a pattern that was originally only in baby/toddler sizes. She is going to re-release it with bigger child and adult sizes. I’m testing one of the child sizes. It will either go to one of my cousins’ kids or to charity, but when the pattern is release I will have the adult sizes muahahaha. I haven’t actually gotten the pattern yet or my assigned size (supposed to come out today) but it has to be done within 3 weeks so I’m going to give myself 21 days. OK, so I completed my Pioneer, and showed it to you last post, taking one WIP out of the list, a very good thing. I have made a deal with myself that for every TWO projects I get off the needles, I can cast on ONE new project. Theoretically, this should help me get all the old projects off the needles because even if I start and finish a new project, I’ll have to finish an old project as well to begin another new project… This is what I tell myself. Because I finished my clapotis and my pioneer, I got to cast on for something new. I chose something quick so that I would be forced to return to the old WIPs… aren’t you proud of me? These are Aran Isle Slippers by Jennifer Lang. 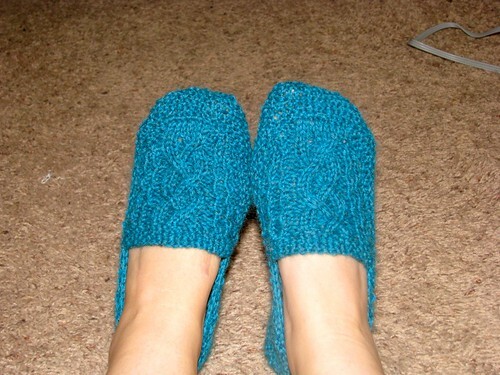 I made them from Knit Picks Wool of the Andes in the color Calypso Heather. I used just over one 50g ball, so they don’t take much yarn at all. The pattern is a bit fiddly because of all of the picking up stitches and seaming. The Wool of the Andes is pretty fuzzy for plain wool (no mohair) so the cable pattern doesn’t really pop out, but they do keep my feet pretty warm in my cold apartment. They are sized pretty small I think. The women’s size says it fits a 7.5 shoe size, which is what I am, but they are very snug. That project was finished very quickly, and now I am forced to turn my attention back to the old WIPs. The next-oldest one I have to show you is mind-numbing and may break my will. This is my OpArt Blanket and it’s only about 20% finished. It’s done completely in garter stitch and it gets bigger every round until there are 888 stitches in the last round. 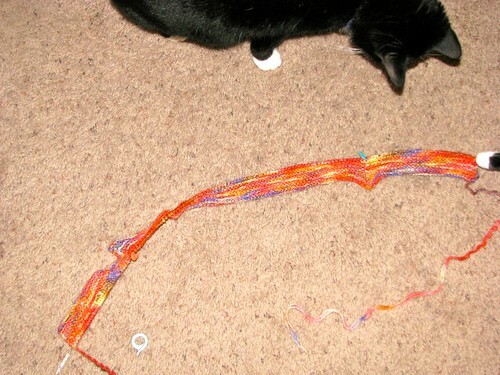 Right now, it’s taking me about 25 minutes to knit one round… It’s not even made out of good yarn. It’s made of cheap Caron One Pound acrylic that I wanted to use up. I love how this blanket looks, but the inanity of it may push me over the edge. Needless to say, this is not the WIP I am currently working on… More WIP shame to come soon.